Before I get to the food this past week, which there were some home run dishes, I wanted to share my wonderful news. I was honored by the Georgia Academy of Nutrition and Dietetics with the Distinguished Service to the Media Award. I was so excited to be presented with this award as I love working with the media and hope to do more of it in the future. Some dear friends and colleagues of mine wrote wonderful recommendation letters, which I so appreciated. 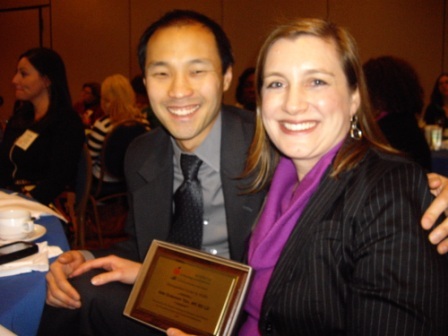 My husband attended the awards luncheon with me, which made it all the more special. I definitely felt I had been in a bit of a rut lately with our menus and this past week certainly shook things up a bit. 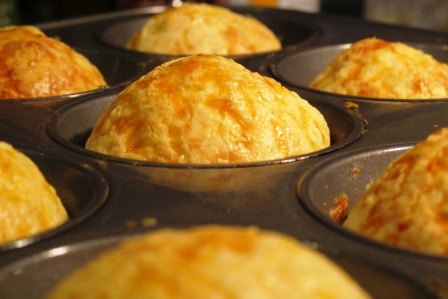 The Pao de Queijo was delicious, though definitely best fresh from the oven. It does not make for wonderful leftovers. I first had these little cheese balls when I visited Brazil years ago and immediately fell in love with them. I had never tried to make my own but this recipe was so quick and easy. I can foresee these being made with some regularity around here! The whole family loved them. The Pao de Queijo was the perfect accompaniment to the Split Pea Soup with Red Wine and Ham, which was fabulous. I loved this soup and E couldn’t get enough of it. And trust me, it is far more delicious than the picture may suggest. Best of all, it was so easy to make in the slow cooker! Although it wasn’t officially on my menu this past week, at the spur of the moment, I decided I wanted to try the Grilled Cheese and Chicken Sausage Waffles. They were amazing. Everyone loved them. I did make some changes to the recipe (used all white whole wheat flour, red bell pepper in place of jalapeno, and turkey sausage in place of chicken). 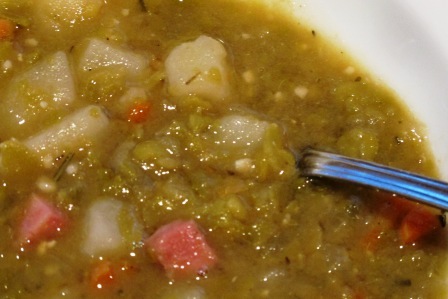 The leftovers were also fabulous cut into strips and dipped into the leftover split pea soup. 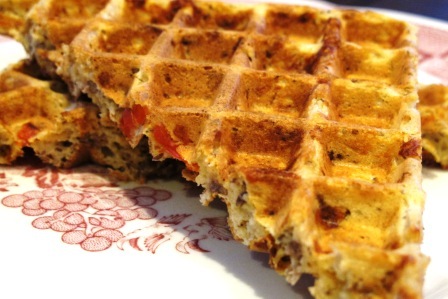 I have never made savory waffles before but I may experiment with some other variations since everyone loved them so much. With the waffles, I put out a big plate of raw veggies and hummus. C had a great time snacking on this while he waited for his waffles and kept eating off it with his dinner. I had read of another dietitian doing this with her children as a great way to get in more vegetables, which can sometimes prove to be a challenge. To help continue to shake things up, my husband and I went to HMart this past weekend. We don’t go that often since it isn’t that close to where we live but when we do, we always stock up on our favorite Asian cooking ingredients (soy sauce, hoisin sauce, oyster sauce, etc.). We also stock up on all kinds of fresh produce. They have just about everything you could possibly imagine and at the most incredible prices. I didn’t have as much time as I would have liked to browse or find something new to try but I still got some good variety. I want to put more of a focus on eating a wider variety of vegetables in our weekly menus. 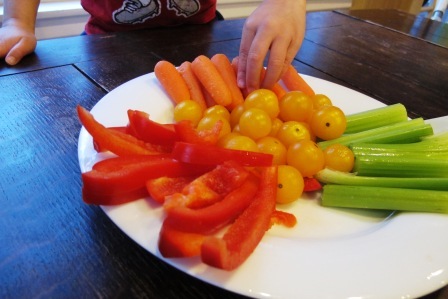 It is hard because C is certainly at a stage where he is picky about vegetables but E is still willing enough. Have a wonderful week. For more menu planning ideas, jump over the Menu Plan Monday on I’m an Organizing Junkie!